Back to Ireland for Arigna Town. A bucolic branch line, Irish style with an interesting selection of locomotives and rolling stock. Belbroughton is a small (for O gauge) branch line terminus, with some distinctive pointwork to get into the fiddle yard. I liked the warehouse hiding the fiddle yard. A pretty well standard ruse, but very neatly done. 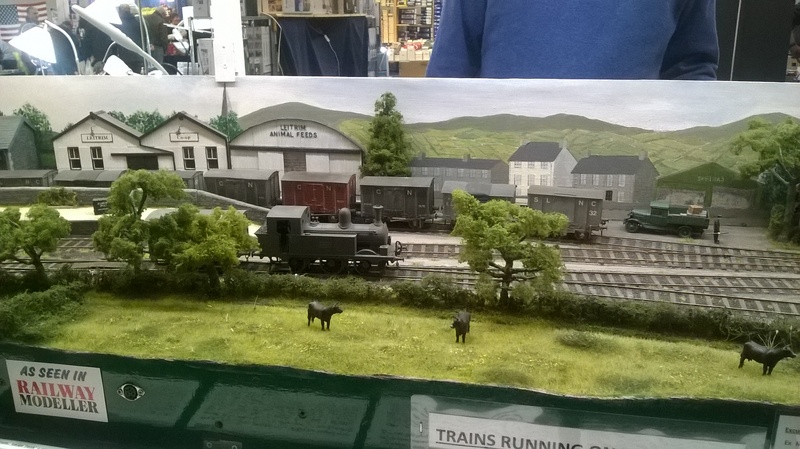 Hemyock is a Scale7 model of the terminus of the Culm Valley Light Railway, latterly run by the GWR. The terminus features a milk processing plant beyond the platform end. Unfortunately, poor lighting in this part of the hall, and the wide O gauge baseboards prevented me getting a photo of this part of the layout. Maske is a model of a station on the north-east coast of England, running NER and LNER stock. I liked the breakdown train out to rescue the stray wagon. The cows look uninterested – perhaps it’s a common occurrence? 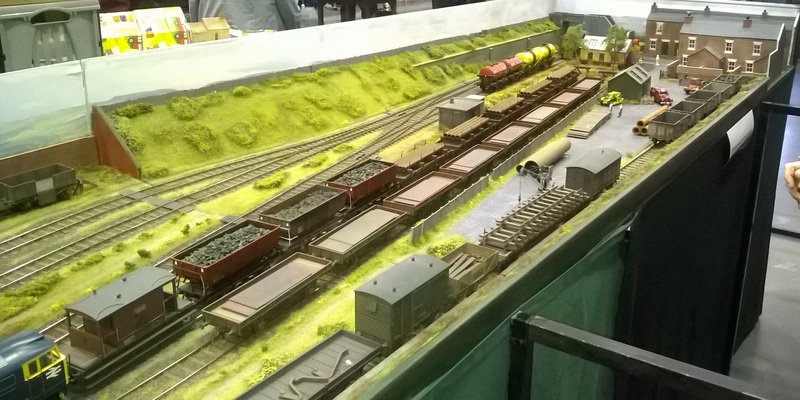 The Stodden Hundred Light Railway completes the O gauge section. 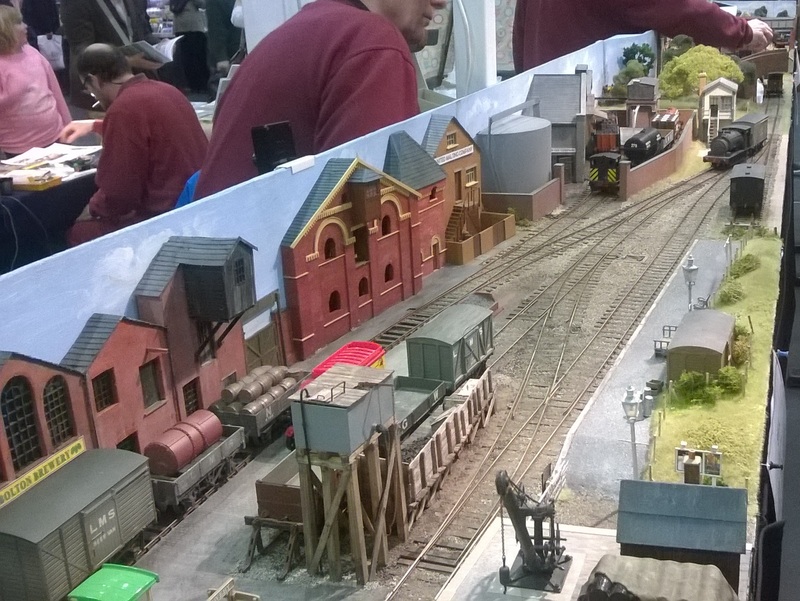 There were a couple of G gauge layouts at the show. Not altogether realistic, but lots of lovely models that look good because of their size. Here’s one shot of Hampton’s End. I missed a few layouts with my camera, but I think this was most of them. Looking through the photographs again, it showed what a good show it was. Isn’t it strange that our memory always tells us that last year’s show was always better? I suspect I’ll be going back next year, as it’s a good day out. And did I find any bargains? I came away with a few things, a Dapol Isle of Wight Terrier and a Stove 6-wheeler parcels van, some small clamps from one of the tool shops, and a couple of cheap, unboxed, Southern Pacific bay-window cabooses. Not a bad haul, really.